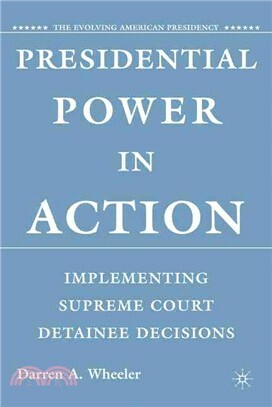 This book will systematically examine how Supreme Court detainee cases have been implemented over time with an emphasis on the role of the president in this process. More specifically, it will test the hypothesis that an active, energetic executive branch has the ability to powerfully shape the implementation process of judicial decisions in a policy area it has deemed important. It concludes that the President, though just one of many actors in the implementation process, wields considerable influence and has a variety of tools that can be used to shape the manner in which judicial decisions are implemented and achieve his policy goals. It also explores why presidents seem to have the upper hand in the implementation process when compared with the power and influence of Congress and the courts. Darren A. Wheeler is Assistant Professor of Political Science and Public Administration at the University of North Florida where he teaches Constitutional Law and the American Presidency. His research interests include the implementation of judicial decisions, presidential power, and the civil liberties in the War on Terror.